Photo courtesy of Boston's Way Home. Looking back on 2017, one of the most promising strategies to address homelessness among older individuals in Boston was the concept of “housing surges.” These events bring a vast array of resources under one roof in order to connect individuals experiencing homelessness with housing and services. Unlike housing fairs, housing surges not only provide information, but also enroll individuals in supportive service programs and make housing offers on site. Attendees may leave with an address and support services the very same day. The surge concept was piloted by the City of Boston as part of Boston’s Way Home, the city’s initiative to streamline access, decrease barriers, and accelerate the housing process for individuals experiencing homelessness. To date, Boston has hosted eight surges, which have helped house more than 225 people. More than half of the individuals experiencing chronic homelessness in Boston are 50 or older. Many have been homeless for years, and often suffer from co-occurring chronic health conditions. 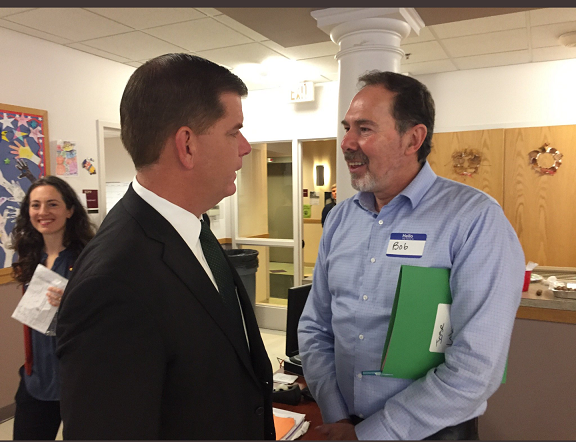 To address their unique health and medical needs, the City of Boston hosted three housing surges in 2016 and 2017 that specifically targeted older residents experiencing chronic homelessness. Securing housing preferences: To increase the likelihood of people securing housing, the City of Boston negotiated with the BHA for priority access, or preferences, to specific public housing units, which were set aside for chronically homeless individuals aged 50+ and linked to MassHealth and EOEA services. Continuum of Care tenant-based vouchers were also available for individuals who did not qualify for a BHA unit. Sharing data: The City of Boston and MassHealth entered into a data sharing agreement. This allowed MassHealth to pre-screen the city’s list of people experiencing chronic homelessness to identify those who are also enrolled in MassHealth, and would most benefit from attending the surge. Scheduling for the convenience of participants: The event took place early in the morning, and shelters and outreach vans provided transportation to the surge. Providing individual pathways: Each individual was met at the door with a “passport” customized to their unique needs and assigned a volunteer ambassador to guide them through the process. For example, individuals who were eligible to sign up for the PACE program or food stamps were directed to visit those services. Ambassadors accompanied individuals through all of the stops on their “passport” to make sure they got the support they needed. Making housing offers on the spot: During the surges, the BHA was able to quickly connect older adults with vacant units. Not only were income certification and eligibility screenings conducted on site, but the Social Security Administration was also available to provide copies of necessary documents related to income, citizenship, and birth. Coordinating health care services: MassHealth connected eligible members with health care services and individualized care coordination. Programs such as the Program of All-Inclusive Care for Elders (PACE), Senior Care Options, and One Care, fully integrate physical health care, behavioral health, and long-term services and supports provided by MassHealth and, when available, Medicare. Identifying a primary organizer: The City contracted with Warakurna, LLC, to organize and facilitate these housing surges. Without this added capacity, the surges would not have been possible. This city/state partnership has been a model of how to make programs and services work for residents who need them most. More than 135 elders experiencing chronic homelessness have attended these surges to date; nearly all of these have been linked with housing and services. “Near the end of my visit, I was standing in a room where the Boston Housing Authority had set up shop, when the room erupted in cheers. I turned to see Lenny, who I had noticed earlier anxiously sitting with his caseworker waiting to hear if he was able to secure an apartment. Now, Lenny was sitting at a table, speechless. With tears in his eyes, he sat staring at a piece of paper. Written on that piece of paper was an address. Laila Bernstein is the Advisor to the Mayor of Boston for the Initiative to End Chronic Homelessness. Emily Cooper is the Chief Housing Officer for the Massachusetts Executive Office of Elder Affairs. Susan Ciccariello is the Director of Care Coordination for the MassHealth Office of Long Term Services and Supports. Gail Livingston is the Deputy Administrator for Housing Programs for the Boston Housing Authority.